Our Friendly Staff At Pumpproducts.com Can Assist You In Placing Your Order. This dewatering pump is intended to be used for pumping water which may contain abrasive particles. The pumped liquid may contain particles up to the size which corresponds to the openings in the pump's strainer. This model is fitted with a discharge hub which may be adjusted to provide either vertical or horizontal discharge using only 2 screws. 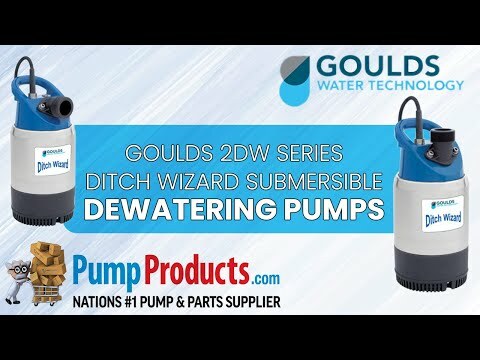 Like it’s cousin the Goulds 1DW series, the Goulds 2DW “Ditch Wizard” pumps are designed to move water from drainage ditches, as well as trenches, basements and manholes. 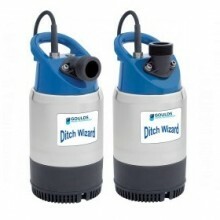 These Goulds 2DW pumps are constructed with durability and corrosion-resistance as its priority. Each pump features a polyurethane impeller and diffuser (with a rubber lining around the impeller), a bottom strainer made of EPDM impact-absorbing rubber and dual seals. These strainers can handle any size incoming solids. In addition, the 2” NPSM threaded hose coupling discharge can be configured for either vertical or horizontal discharge depending on the piping. The Goulds 2DW pumps come with a single phase motors built with automatic full overload and temperature protection. These pumps can also be submerged up to 16.5 ft.
Pump Products application engineers are standing by to help you find the right pump, as well as to provide price quotes, stocking availability and shipping information. Call our toll free number 1-800-429-0800 to speak to an expert today.